Happy 45th National Day Singapore! 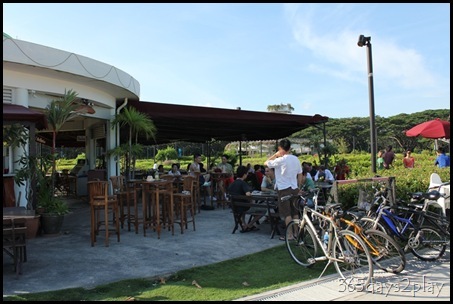 If you’ve been to East Coast Park and cycled in the direction of Changi Airport, you might have chanced upon a little bistro / cafe called Sunset Bay Garden Beach Bar, also known as Sunset Bay Garden Bistro. It feels like an oasis in the middle of nowhere. 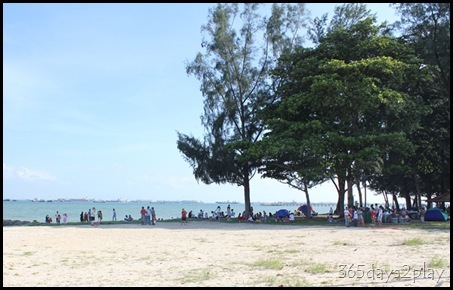 One minute you’re cycling along the beach with only the vast expanse of sand and sea to greet you (think Singapore context), and suddenly, out pops Sunset Bay. 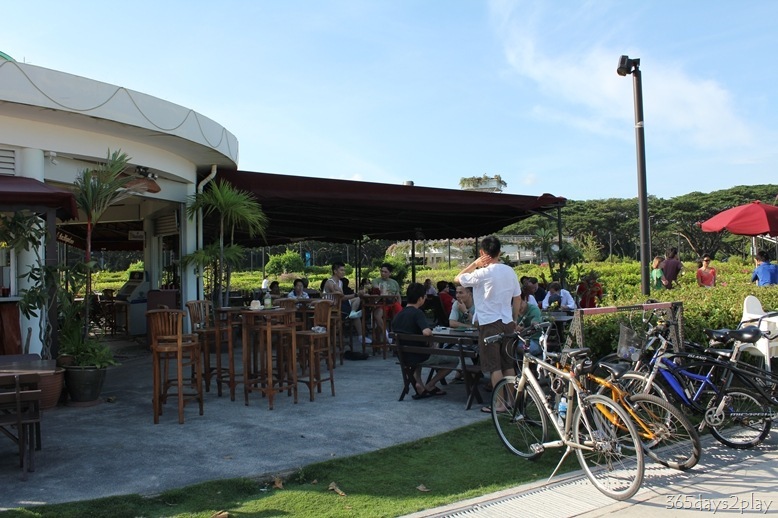 Most cyclists don’t stop here to have a drink thanks to the pay per hour bicycle rental. It takes about 1/2 hour to cycle here from the McDonalds’ area. 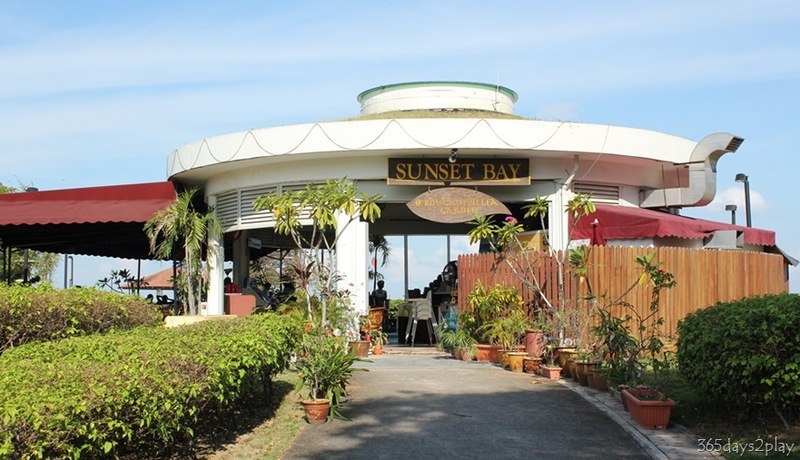 So I’ve always known about the existence of Sunset Bay, but up until now, I’ve never had the opportunity to visit it. Apart from cycling, it’s practically impossible to get here without private transportation! We got a really good seat facing the sea when we got to Sunset Bay. It was a really hot day, but luckily, the breeze was strong. Don’t you think Sunset Bay looks postcard perfect with the blue skies in the background? There’s only Al-fresco seating here, no air-con for the Tai Tai types. More than half the place was taken up by Caucasians, chugging down beer after beer. It really doesn’t feel like I’m in Singapore! 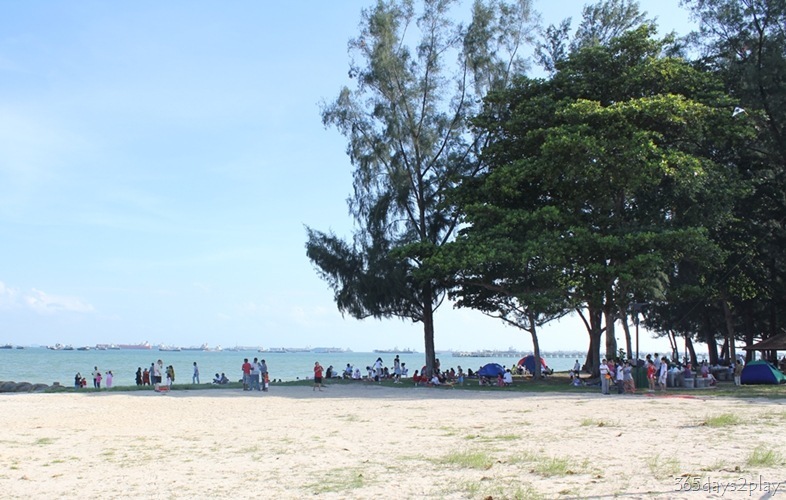 Even though I’ve been to East Coast Park so many times, this must be one of the most unique experiences! 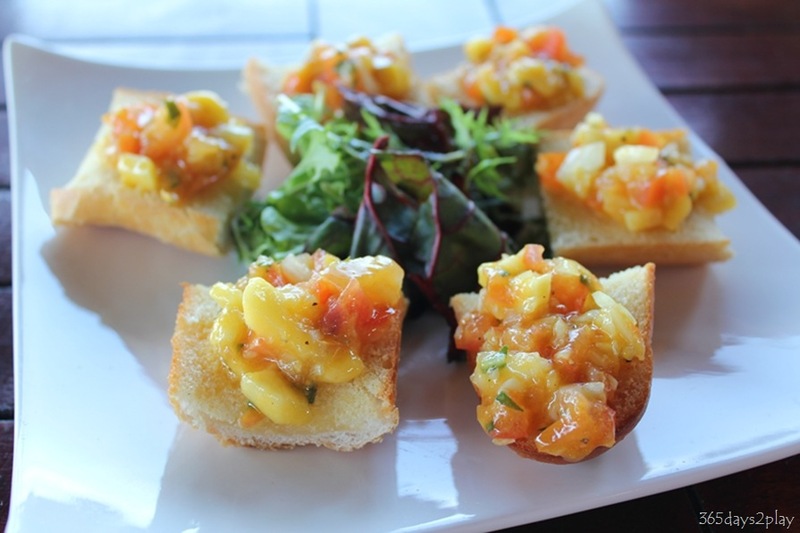 We weren’t hungry so we just ordered a mango bruschetta $10.90 to share. The toppings were wonderfully refreshing and paired well with the garlic bread. I only wish the bread was toasted longer. 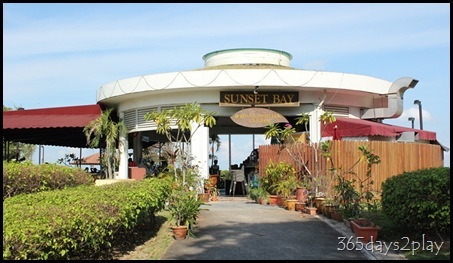 I was very surprised to find that for such far flung cafe, Sunset Bay has quite an extensive menu ranging from Pizzas, Pastas, Tapas, Finger Foods like Chicken Wings $6.90, Spring Rolls $4.90 to even main courses like Beef Tenderloin $29.90, Lamb Shank $22.90 and Mutton Vindaloo $20.90, just to name a few! They even have my favourite Scampi $17.90! 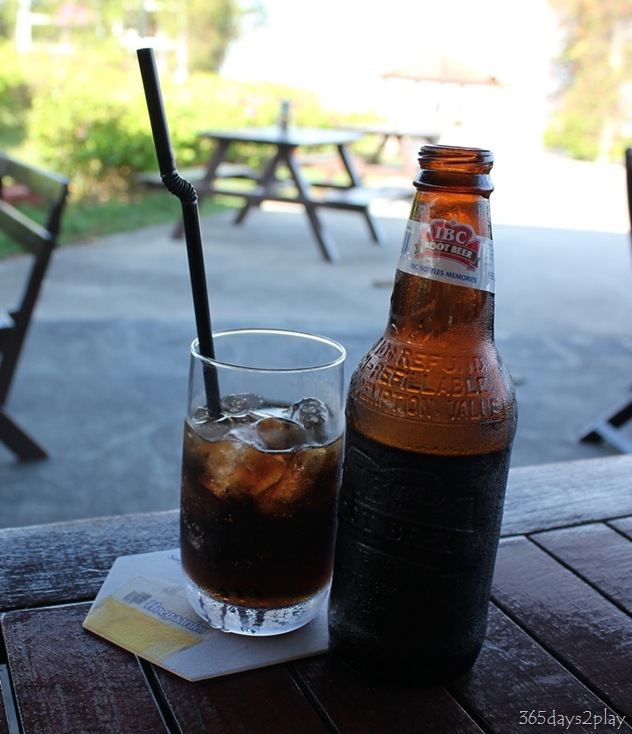 Bottled beers go for $8.90. San Miguel Tower goes for $45. We are definitely coming back for dinner sometime soon. 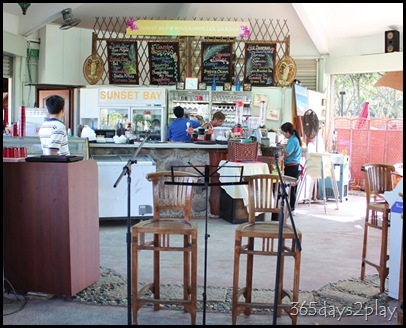 Check out Sunset Bay’s website for more menu selections. Just don’t bank on the coffees here, we ordered the latte and it was quite bad! 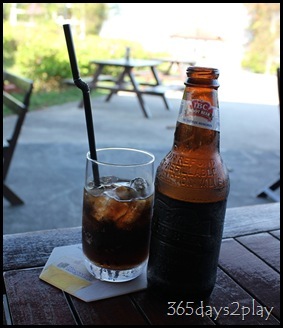 Sipping my pseudo beer, with the sea breeze in my hair, blue skies and blue seas in front of me, the perfect way to relax. Come at the right time and you might just get to enjoy some live singing. 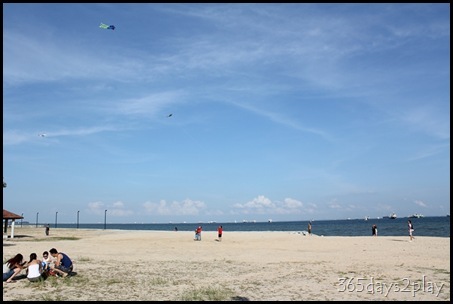 Driving Directions: The best way to get to Sunset Bay is to get onto the East Coast Park Service Road from the ECP near Bayshore. From there, just keep driving in the direction of the Airport, until you see Carpark F2. The area around Carpark F2 is a 1 way road in the direction of the Airport, so if you’re driving on the ECP in the direction of town, don’t enter the ECP Service Road too early! Free parking everyday, people! Enjoy! rec No 0045 2nd Jan 2011. I was there with friends and was v disappointed with the quality and the price.In the menu Latte was mentioned as $4.50 and I did not know that the cold latte is a dollar more.I saw the waiter serving another person with foam on top so I decided to order the same but mine was without the foam so i asked them which they took back and still no foam.besides the coffe was very ordinary.Your price is about the same as Starbucks but Starbucks coffee is definetely superior.This tasted so milky and not much of coffee taste which I can make at home perhaps better. 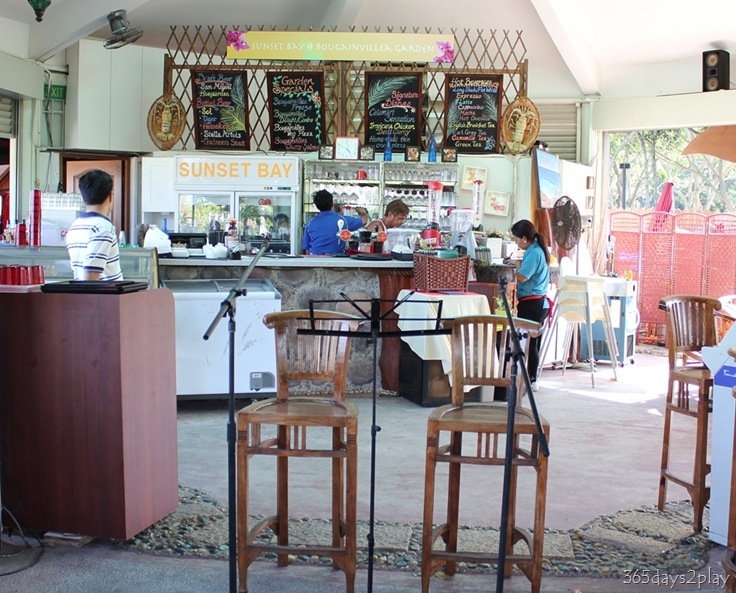 I like the place and the atmosphere but unfortunately I was not satisfied with the coffee. Also when coffee was served no napkins were given and I went and took them myself. Service wise, was okay but nothing spectacular. Did you have anything to eat there? 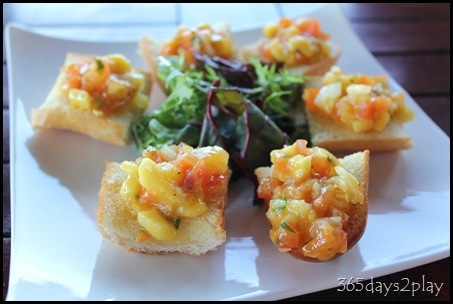 I thought the bruschetta was quite good, but we didn’t have any mains.